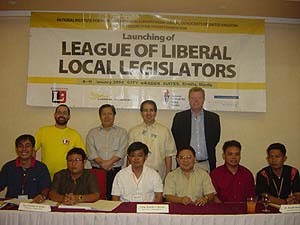 The "Liberal Local Legislators League"– or L4 – was formally launched in Manila on January 9th, 2004. This new allied group of the Liberal Party of the Philippines (LP) is composed of vice-mayors, board members, city and municipal vice mayors and local councillors. Among the first well-wishers, Dr. Ronald Meinardus, the Resident Representative of the Friedrich-Naumann-Foundation, said that the creation of the new body is a further indication of the dynamism of Philippine liberalism. Addressing the delegates from all parts of the country, Dr. Meinardus said: Local autonomy is a key principle of liberal politics. Therefore, this new liberal network of local legislators is of strategic importance.” Dr. Meinardus also said that the liberal Foundation would support training activities for L4- members in cooperation with the National Institute for Policy Studies (NIPS). The delegates to the conference drafted the L4-constitution and bylaws and also elected the national leadership. 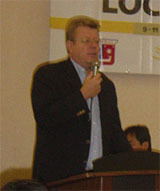 Mr. Melvin Macusi, Councilor of Sudipen, La Union was chosen as the first chairman.